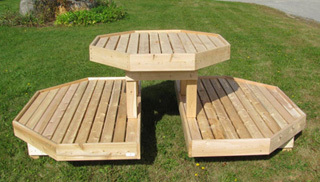 This photo is three of our 3TSets three-tier octagonal groups. The painting of the fascia board makes the displays stand out even more to attract customer’s attention to the area. 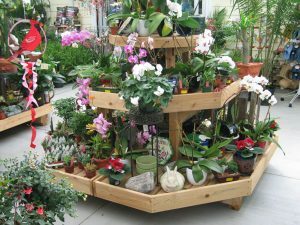 The display group is made up of two B8EC 88″ end cap benches (lower level) on 11″ legs, A TO5 5′ octagonal on 23″ legs and a TO3 3′ octagonal on 17″ legs. The levels are 12″, 36″ and 54″ off the floor. This is our most popular highlighter. Used extensively as a central focal point for higher value plants and merchandise. Blocked with “what’s in color now” it is an extremely attractive display, benefiting in faster product turns and higher sales. 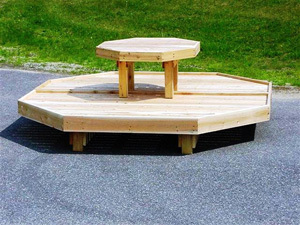 Composed of two B8EC 88″ end cap benches placed back to back on 11″ legs and TO4 – 4′ foot octagonal with 23″ legs. 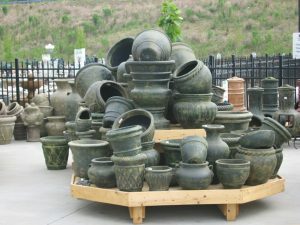 Excellent highlighter for nursery stock, pottery or statutory. Use short legs for bigger products. Use 17″ legs for 2, 3, or 5-gallon material if you place the first layer on the ground. A similar setup with the lower level separated. This setup requires move space but frees up the lower bench for products. 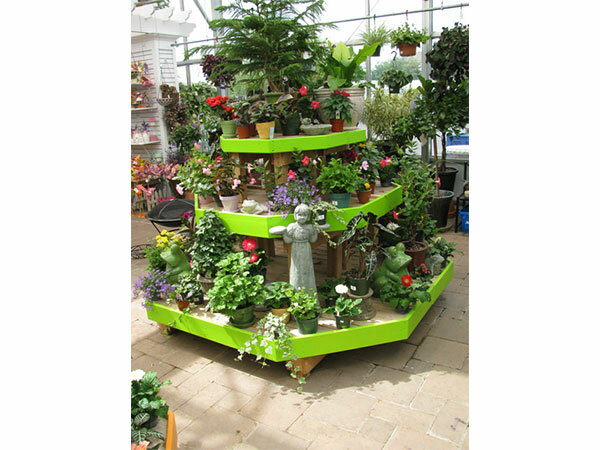 The second tier here is a T05 – 5′ foot octagonal. It could be a T04 if desired. Either way the top tier adds vertical interest to catch the eye and the bottom level gets the product off the ground for easier customer handling. 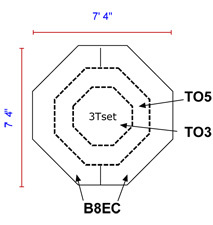 Our H3TSet is half of our 3TSet. 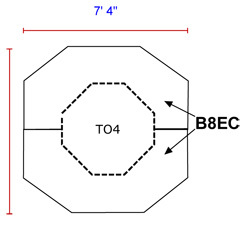 The group is made up of 1 B8EC – 88″ end cap bench on 11″ legs, 1 B5EC – 5′ end cap bench on 23″ legs, 1 B3EC – 3′ end cap table on 17″ legs. 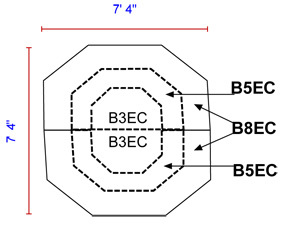 The bench height off the ground is 12″, 36″, and 54″ respectively. 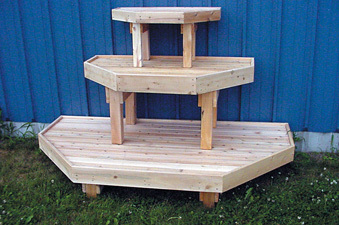 Two of these sets back to back make a three-tier octagonal set. 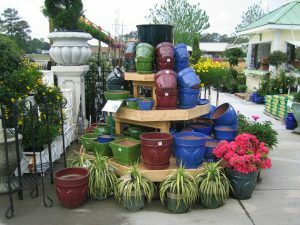 Purchasing two sets like this to create a full octagonal set is more expensive but it offers you more display options. 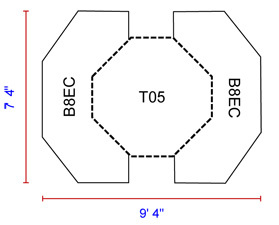 The halves can be placed against a wall as shown in the photo or pieces separated to make up end caps on bench rows. 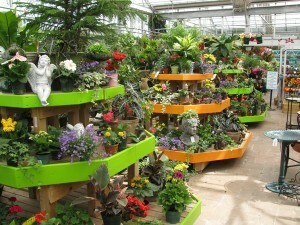 The flexibility has a lot of value in rearranging new and different seasonal displays.